Bring your own horse and work on what ever you feel need work and progress together. As you know John is committed to finding quiet effective ways to resolve even the most difficult problems with horses. Working with patience & understanding, he always looks from the horses point of view. You are welcome to bring your own horse and work on what you feel you need help with. If you have a youngster who needs starting, need help with your ground, ridden work, any problems you are having or you just want to gain knowledge these courses are tailored to suit you and your horse. Unlock the secrets of gentle horsemanship. Gain Lightness & Consistent Clear Communication. To enhance that special relationship between you and your horse. 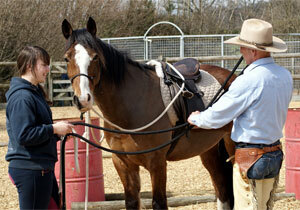 An investment for you, your horse and your horsemanship. Learn and have fun together.